Senate Bill S-1870, “The Pet Store Disclosure Bill” was signed into law on February 5, 2015 and codified as N.J.S.A. 56:8-92 through 95.3. This law establishes additional requirements under the Department of Law and Public Safety, Division of Consumer Affairs for all pet shops or pet dealers to provide breeder information to consumers about each cat or dog being offered for sale. Under the law, the owner or operator of the pet shop is also required to keep this information up-to-date, ensure that the appropriate website and contact telephone number are functioning, post the current website and telephone number, and make changes to the signage as necessary so that the consumer has access to the correct information regarding the source of the animals at all times. The bill further prohibits any pet shop from selling any dog or cat purchased from any breeder or broker cited for violations by the USDA. However, the provisions of this bill do not affect the pet shops and kennels from selling or offering for adoption any animal from New Jersey animal pounds, shelters and animal rescue organizations that are tax exempt organizations. This law is considered one of the toughest pet shop and pet dealer laws in the nation. Health Officers should be familiar with the law in order to address public inquiries, although this new law does not impact the sanitary inspections of pet shops and kennels conducted by local health departments to ensure compliance of N.J.A.C. 8:23A Subchapter 1 for municipal licensure, under the authority N.J.S.A. 4:19-15.8 and 18. The owner, operator, or employee cannot diagnose, treat, or prescribe any treatment or therapy for any disease, injury or physical condition of any animal after it has been sold. The owner or operator is allowed to vaccinate animals only under the order of a veterinarian prior to sale (N.J.S.A. 56:8-95 Section 4 e.). There are a lot of breeders out there. How do I choose the right one? Not all breeders were created equal. If they were, do you think we’d build a web service called Search Breeders??? Unfortunately, this means that if you’re not careful, you can end up purchasing a pet from someone who is less than responsible, or even unethical. We want to help. First things first, are you ready for a dog? It’s easy to succumb to the cuteness of the puppy in the window (or online for that matter)…but are you really prepared to take on the responsibility of taking care of a pet? According to the Humane Society, roughly 40% of dogs do not make it through their first year with their first owner – and are instead returned to the breeder, given to a shelter, or even euthanized or abandoned. In most cases, the reasons provided include a mismatch in the behavior, personality, or activity level between the dog’s owners and the dog. If you are going to happily live for 10 or more years with a dog, it is important that the dog fits into your lifestyle. Can’t stress this one enough. DOGS COST MONEY! Between the registration, training, grooming, food, vet bills, insurance, (not to mention treats and toys! ), you need to make sure you’ve budgeted for years of pet ownership. The average cost of a healthy dog can costs upward of $2,000 per year. Time, time, time, time, time… At their convenience, not yours. Dogs need tons of attention and exercise. If you do work long hours or spend extended time away from home, consider taking your dog to a friend or a doggie day care. No slacking here! Keep in mind that having a dog also affects your freedom or ability to make plans on a whim. All dogs need exercise – the bigger the dog, the bigger the space required (outdoor space is a plus for any dog). Plenty of walks are also a must! Sound good? Are you planning on staying put or moving soon? Dogs become acclimated to their environment, and a move can cause accompanied changes in behavior based on a variety of factors. Also, if you rent, you’ll need to check with the landlord or property management company to make sure dogs are allowed in the building (many buildings have regulations on breed type or dog size). If you’re frequently away, owning a dog may not make the most sense – kennels are expensive and can also affect your dog’s behavior and temperament. Certain breeds are prone to causing allergic reactions (and shedding). Make sure the people you live with are not allergic to your dog breed before purchasing a pet. There are plenty of hypoallergenic options available as well. Training a new pet takes a lot of patience (whether we’re talking commands, potty training, or tricks). Make sure you’re willing to spend the time and energy to help your dog learn correctly. Training a new pup typically takes 3-4 months. Okay, so you want a dog from a breeder. How do you choose the right one? So you’ve thought long and hard about whether or not you can realistically bring a dog into your life, and have decided you’re going to go for it! Woo-hoo! Do you already have a breed in mind? If not, there’s plenty of info on the World Wide Web to help you decide. You’ll want to consider things like size, temperament, shedding, and activity level, etc. Once you decide on a breed, Search Breeders can help you locate nearby breeders (and eventually compare ratings/reviews to vet the good from the bad). Unfortunately there are varying degrees of responsibility when it comes to breeders…and of course, puppy mills, a term used to describe a breeder that is raising numerous dogs in unethical conditions. And while ratings and reviews from the community are a solid place to start, it is helpful to establish a set of guidelines to look for and ask about as you interact with breeders on an individual basis. There are many breeders who are very responsible, take care to raise their animals ethically, and will be a great source of information to help you with your new pet. 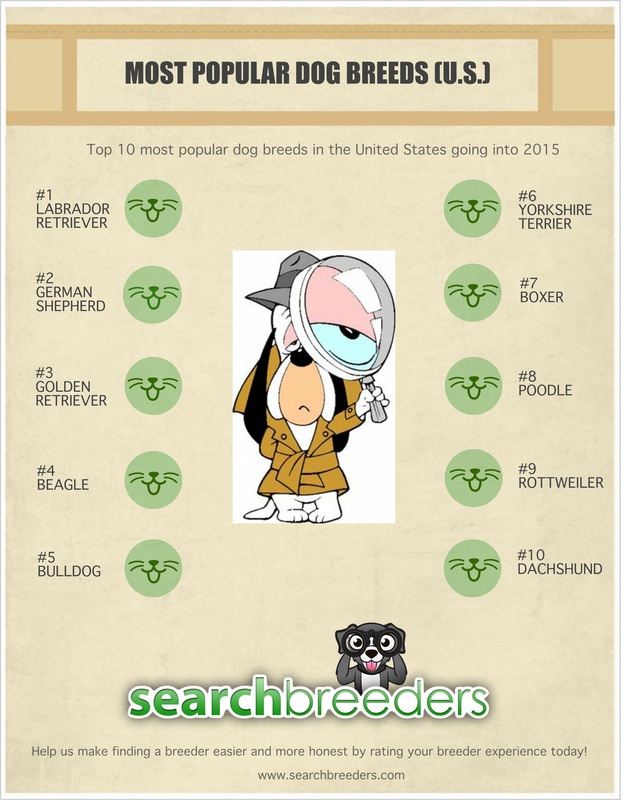 Most breeders have some online presence (their own website, social media pages, etc.). It’s always a good idea to check out their site and browse pictures and information to get a better idea of their breeding practices and conditions. You should also contact a few of your top choices to speak to them in more detail. How long have you been in business? It’s a good sign if they’ve been breeding for several years. How many breeds do you sell? It’s not an absolute red flag, but you should be careful with breeders who breed many different breeds. Do you have any club or organization certifications? Many breeders belong to breeder clubs, whether on a local or national level. These organizations often require that quality standards be met, and are a good sign. How often do you breed? You want to avoid dogs that breed every cycle as this is considered over-breeding and is not healthy for the mother. It’s very common to find a breeder that does not have currently have available puppies – it pays to wait if you’ve found one who is responsible and has lots of positive reviews. Why this breed? Typically this question will help show you that the breeder is passionate about the particular breed, and not just looking to make profits off of their dogs. Do you have any club or organization certifications? Many breeders belong to breeder clubs, whether on a local or national level. These organizations often require that quality standards be met, and are a good sign. American Kennel Club is probably the most common, but each individual breed will have its own organizations and clubs as well. How do you socialize the puppies? Ideally the puppies are raised inside a household, so they are adjusted and comfortable in a home environment. However, it is not uncommon for breeds to be raised in a separate kennel – if so, it is important that they have frequent contact of people of different ages so they are comfortable with human interaction. How old are the parents? Dogs should not be younger than 2 years or older than 12 years. Are the parents certified? Different health risks are associated with each breed, so it’s a good sign if the breeder has the parents certified to protect against these problems. What are the typical health and developmental risks associated with this breed? Responsible breeders will provide you with detailed accounts of health risks, and should be willing to provide documentation to ensure the parents have been properly tested and evaluated to avoid them. Is there a guarantee? A reputable breeder will offer some type of return policy if you are unable to care for your dog. No guarantee is a bad sign! What vet care has been provided / will be needed? A good breeder will have information available for vaccinations, de-worming procedures, micro-chipping, and other vet care. Can we contact you after the sale? Responsible breeders will stay in touch with you to make sure everything is going smoothly after you purchase a dog from them. As a bonus, many breeders will provide you with a starter pack that includes tons of information, food, toys, etc. to help you get started. Can you provide me with some references? Contact a few of their references to ask about health and temperament of their pets, and their experience overall. The environment is the first thing you should evaluate. It should be clean and tidy – breeders should clean out excrements several times a day to avoid risk of spreading disease with the young puppies. As mentioned above, an ideal setting would be a family home, or at least a location with frequent human interaction to ensure the dog will be accustomed to living with a family. You will also want to make sure the puppies are getting frequent outdoor exercise, and are not left alone for more than a few hours in a given day. Water and food should be available to the puppies. One other thing you should notice off the bat is how much the breeder is interviewing YOU! Reputable breeders will want to make sure that you are going to be a responsible pet owner, so the questions and answers should be flowing in both directions (not just you asking them). Good breeders welcome visits to their home, so beware any breeder who is hesitant about your visit. Interact with the puppies. A lot of times breeders will allow you to do this alone, but either way you will want to play with the dogs to get a sense of temperament and perhaps, activity level. The puppies should appear healthy, lively, and clean – they should not look thin, nor have a bloated stomach (which can indicate worms). Meet the parents (or at least the mother). You should also interact with the parents of the litter to get a sense of how your adult dog will look and act! The mother dog should look healthy and be well taken care of, though initial hostility toward you is not a red flag (it’s not uncommon for her to be protective over her litter). Talk to the breeder about the character and energy level of the dogs in their litter. They’ll likely know the individual personalities and can help you decide which might make the best fit. Avoid anyone who lets you take home a puppy before 8 weeks of age. Should you visit a breeder and find that you are concerned about the welfare of the animals, you should immediately contact your local humane society or SPCA. Step 4: Celebrate! It’s time for puppy love! You’ve made it! Enjoy the amazing gift of having a pet dog, and be sure to give them all the love and attention they deserve!